This is a story without an ending, mostly because it would have cost me thousands of dollars to find out how it ends and I couldn’t afford that much money to find out what was true and real. I’m posting the story because when I tried to find more information, none was available, so maybe this will be useful to someone else. after the auction I would need to get a second cashier’s check to pay the balance on the car (including a $500 auction fee). 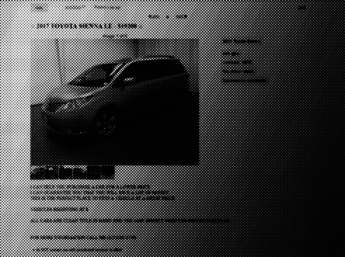 She sent me screen shots from the auction website of a number of cars that fit the profile of a vehicle I was looking for. This seemed like the best way I could imagine to get a great deal on a car. Getting to see over a dozen cars all at once was well worth $300 for my time. As my wife and I discussed it we couldn’t figure out if this was too good to be true or if I had stumbled on the new way I was going to buy cars from now on. Having my own personal wholesale auto broker seemed great. We couldn’t figure out what we might be missing that would allow her to scam us. Except for $300 all of the money was going to the auction house. I did a quick google search to see if this was a well known scam and found this story. There were a few elements that lined up exactly and a few others that were different. The main take-away was that taking money freely given to you and then not delivering a car is not necessarily illegal. At best I could sue her but that process is long and cumbersome IF I was even able to find her afterwards. I asked for her license number and address. She gave me her license number but no address. Even if she had given me her address, it could easily be faked, same with the license number. I had no way to verify them. I called my friend Matt who lives on the other side of the country and is the General Manager at a brand name dealership. He’s had over 25 years of experience in the industry. I said, “I just need to know if this sounds like a scam”. Within 45 seconds of laying out the details to him and one of his associates they said “Don’t do it, too risky.” So, I didn’t do it. I’d be a fool to ask for his wisdom and then not follow it. He’d been to dozens of auctions and never had to pay a guest fee. Why was she baking in this extra expense and not just asking for $300? My cashiers check would fund her auction account. She could do literally anything she wanted with the money in her account (and this wouldn’t be illegal because I freely gave it to her). Auto auctions are fast moving and chaotic. It would be easy to lose sight of her or for her to purchase a different vehicle without my understanding or knowledge. She could drive off with the title when I went to get the balance. The auction house would not protect me as a customer. They work with dealers only, not the public. ALL of the paper work would be in her name. They don’t care why I freely gave her a check to fund her account. Another possibility is that she would try to charge me a outlandish (hidden) processing fee for the registration and she’d be holding the title until I paid it. I told her I wasn’t calling her a scammer, it’s just that the situation had too many holes for my comfort. She responded that there was no way she was going to do things the way I suggested because she had to protect her own money. So. . . that’s it. I don’t know if it’s a scam or not. I ended up buying a vehicle from a private seller for about $750 more than I would have spent at the auction. When I did a search for Martiza’s info I didn’t find anything. So here it is if someone else is looking into her. I’m not accusing her of any wrong doing. She did not steal from me. As far as I know there was nothing criminal in our interactions. If you’ve done business with her let me know how it worked out.